Download your free guide – simply enter your details below. Weddings require a lot of planning, especially if you are getting married abroad. 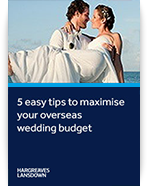 Make sure you get the most from your budget with these 5 easy tips.This guide is not personalised advice. A wedding is a life-changing event. Don’t miss out on these 5 easy tips.